The premium Chase credit card for the serious international traveler. Receive 30,000 bonus points, which can be used for two (2) free nights at many Holiday Inn and Holiday Inn Express Hotels worldwide. You will qualify for and receive your bonus after your first use of the card for any amount, which even includes balance transfers. After the first year you will receive an Anniversary Free Night e-certificate valid at hotels in the Priority Club Rewards Family of Brands and must be redeemed, and the stay must be completed, within 12 months from date of issue. Anniversary Free Night e-certificates are valid for one standard room night rate and all reservations utilizing the Anniversary Free Night e-certificate must be booked by calling the Priority Club Service center at 888-211-9874. Your points will add up quickly when you stay at an InterContinental Hotels Group because you will earn 5 points for each $1 of net purchases. Learn more about the awesome benefits of becoming a Priority Club Member and the many other features and gifts it offers. Also you pay no foreign transaction fees on purchases outside the United States. You receive a whopping 10% rebate on Priority Club Point Redemptions (a maximum of 100,000 points back each year applies). As a member Priority Club will give you 2 points per $1 spent on eligible gas, groceries and dining, with 1 point for other eligible charges. There is no annual fee the first year, and modest charge of $49 per year thereafter. 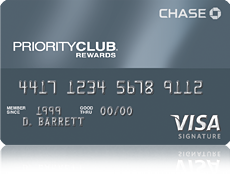 Apply here for the Chase Priority Club Select Rewards program.